Same output statements (time slices, everything). Otherwise, it will be impossible to know what is responsible for what if there are different results. Once it has been established that everything is the same (or if there are changes, that the results are an improvement) should one contemplate further cycles (it will take ~ 500 times -I emphasize times: multiplication of the present number- more cycles to reach anything close to steady state if the exponential magnification of the last cycles is representative of the long term exponential magnification. ). Given that that is a huge number of finite difference time steps (6500*500=3.25 million time steps) and that it would be prudent to examine the progress of the numerical solution for stability (and interaction with round off error accumulation) I would advise that it should first be studied how to run Meep in increments such that intermediate results are saved to enable shorter runs, examination of intermediate data and re-start with the finite difference data needed to continue. Run with the RF feed ON for the same number of FD Time Steps (6527 ? ), and turn RF feed OFF at that point and run for another identical number of steps (over 13,000 time steps). I'm working on the losses of energy through the perforated copper asymmetrical waveguide and perforated endplates on my EMDrive design. I've found it's important to look at each hole as a tiny little waveguide and the incident angle of reflection of the 2.45 GHZ propagating wave within the cavity effecting it... so I'm number crunching. Before I head back into disproving the heavy flack I've gotten in using a perforated copper frustum I want to as Dr. Rodal a question that was bugging me as I reviewed the images dancing in my head (like counting sheep) before falling to sleep last night. Why does sequence of images show increasing levels of activity outside of the frustum solid boundary walls in your simulation? Stepping through each one it was apparent when you're calculating the stress tensor component strengths it shows up outside the cavity. Is this an artifact? Todd, looks like great info and will read a later this morning. TT, nice bluetooth setup, make sure you wear your perforated foil hat when running to protect your gray matter. The stress outside the EM Drive is zero in all cases I recall (have I missed one? -- in which case please indicate the figure ?) . The planes outside the EM Drive have different color because I plotted them with automatic Max Min rendering to show the shape of each stress field no matter how much smaller amplitude. Blue is minimum and Red is maximum. A plot ranging from 0 to +0.02 will show a blue plane for 0, while a plot ranging from 0 to -0.02 will show a red plane for 0. A plot ranging from +0.02 to -0.02 will show a green plane for 0. In this case (unlike in the early Meep figures) it is OK to do this because I am showing the numerical magnitude of the stress tensor in the vertical axis. In the early Meep output that was made into movies, no numerical magnitude was being shown. Hence I was objecting to being shown images with changing colors where we did not know what was the numerical meaning of the colors. Please notice that the numerical magnitude of the stress generated by the antenna at its maximum is several times greater than the stress shown in other images. Eventually we should do that, I agree. 2) Plot the Stress Tensor at other locations (eventually we would have over 260 circular cross sections for the whole model to explore). The stress outside the EM Drive is zero in all cases I recall (have I missed one? -- in which case please indicate the figure ?) . The planes outside the EM Drive have different color because I plotted them with automatic Max Min rendering to show the shape of each stress field no matter how much smaller amplitude. A plot ranging from 0 to +0.02 will show a blue plane for 0, while a plot ranging from 0 to -0.02 will show a red plane for 0. In this case (unlike in the early Meep figures) it is OK to do this because I am showing the numerical magnitude of the stress tensor in the vertical axis. In the early Meep output that was made into movies, no numerical magnitude was being shown. Good to know that was an intended artifact. I expected a high level around the antenna and it's nice to see but what else I find totally unexpected is the vertical flattened pancaked shape, is that due to the end cavity plates? A animated visual would be great for those viewing here that get lost in the heavy maths tagged with a ELI5 descriptor. It was a convenient (*) color-rendering artifact, the numbers are innocent: the numbers in the vertical scale are correct in all the images, hence a color-rendering artifact rather than numerical artifact . (*) It was easier for me to set PlotRange to Automatic, than to run through all the Max and Min and having to re-set all the Plots to be rendered to the same Max Min color rendering scheme. At the beginning of the computation we don't know what the Max Min are going to be, so it is more expedient to set the range to Automatic. The Max Min color rendering scheme can only be done post-fact after the results have been obtained for a cycle. IMO, it would be more important to measure the energy and frequency stored at the small end, vs the energy and frequency stored at the big end, and maximize the difference. The Q means nothing, what matters is the difference in potential energy between the two ends. I do hope we're not entering TT Brown "asymmetric capacitor" country with that remark. I think we all know that that particular line of enquiry ended badly! Nothing of the sort! Just a simple change in potential energy, due to the gradient in the geometry. Need information on what is the input power you set as an initial condition for Meep: how did you decide the parameters to use for the antenna? The magnitude of the stress depends on the input power. 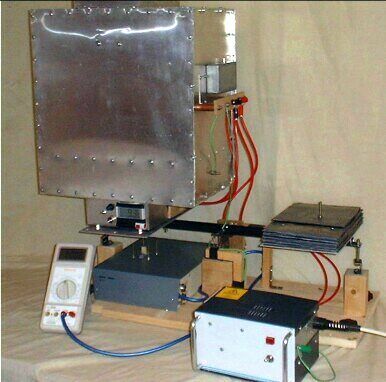 What Shawyer did with his 1st Experimental EMDrive (attached) is a good reference. Who is interested in the subject and has a lot of money? See the NSF thread on EM Drive X-Prize, where an entrepreneur was interested in starting an EM Drive X-Prize . That thread gives actual numbers for how much money was the X-Prize supposed to award. Mixed response, including skepticism about whether the EM Drive is an artifact, whether an EM Drive implies "free energy" (a big no-no for funding ), controversy about how to measure a significant X-Prize achievement, controversy whether there should be an EM Drive X-prize, how to prevent artifacts from award competition, and the spontaneous rise of a number of inventors willing to use their own time to demonstrate the EM Drive put a halt to the initiative until after this summer. It may get re-visited again this coming Fall. Hi guys, layman here, though I've been following the threads for the last few months or so. A question popped into my head today - can photons collide/interfere, and if so, do they perform behavior that may change the outcome of the meep results? A Google seems to return conflicting sources on whether photons collide, and what happens in that case, but considering we're pumping a constant stream of the things into a highly resonant container (if I'm understanding Q correctly), I figured it might be worth mentioning. Also, I know stardrive went incommunicado after the 'warp drive'media fiasco, but does anyone have any inside information on whether the Eagleworks test is still going on this month? Concept drawing previously posted by Star-Drive (Paul March) for a magnetron feeding RF to a water-cooled EM Drive at the center of the small base of the EM Drive. EDIT: Paul March also uses spherical (instead of flat) ends, and places the magnetron at the apex of the cone, extending the EM drive towards the minimum small base diameter possible to accommodate the magnetron. Not concerned about "cut-off" nonsense limits based on cylindrical waveguides (that do not apply to truncated cones). He also plans to excite the lowest natural frequency TM010, which has the highest amplitude of all modes. Also his design to use the present NASA frustum with an internal partition to resonate at 2.45 GHz in the lower mode, higher amplitude TE011 for the Interferometer tests. I want to build this version as I feel it might produce results we can actually do some validation on; looking at working with some local universities and fabrication shops. Seems easy to build and relatively cheap ($20K). HOWEVER in discussions with the magnetron manufacturer the unit he is looking at the unit is doing just 915MHz vs. 2.45GHz on current experiments. I see he has a slide at 957.8MHz - is that what was used for the 17" OD long and 28" length (TM010 design?). Can anyone confirm that (or better yet design for TE012 at 915MHz)? Why does he go 957.833MHz instead of the commercial 915MHz? Is this going to be impossible to tune to resonance given if you buy that magnetron it has a set frequency?